1985-86 O-Pee-Chee Hockey saw its set size cut to 264 cards. That ended an 11-year run where 396 cards was the standard. The design was simplified as well, which was a welcome change to the ever-growing elaboration among sports card sets as the 1980s wore on due to competition and the proliferation of auxiliary sets. 1985-86 O-Pee-Chee Hockey fronts feature a game-action photo of a player. The top border of the picture have a wave pattern, with the logo of the player's team in a top corner. A strip along the bottom names the player and gives his position. Backs are oriented horizontally and printed in red, salmon and blue. A strip along the top contains the card number inside a box and the player's name. His vital stats appear just below that. The main area of the card contains a year-by-year statistic review and a short biography in both English and French where it fit. Card 110 is a memorial to Pelle Lindbergh, who died tragically the previous season. Cards 257-264 featured the individual league leaders in several statistical categories. There are also two checklist cards in the set. 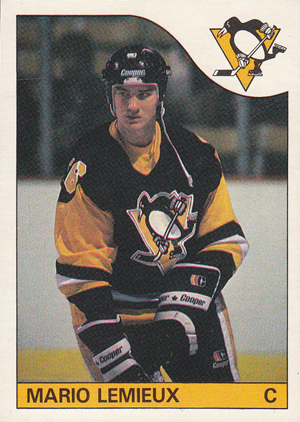 The key card in 1985-86 O-Pee-Chee Hockey is the Mario Lemieux rookie, which accounts for a large percentage of its value. Other notable rookies include Kevin Dineen, Dave Ellett, Kelly Hrudey, Al Iafrate, Al MacInnis, Kirk Muller, Tomas Sandstrom and Peter Zezel.